Use almond milk instead of milk if you prefer. Pour the milk and sugar into a pan and bring to the boil over a moderate heat. Remove from the heat and add in the gelatine, stirring continuously to ensure it has fully dissolved. Place the hot milk in a bowl, then place the bowl in iced water for 5–10 minutes, ensuring that it does not set. 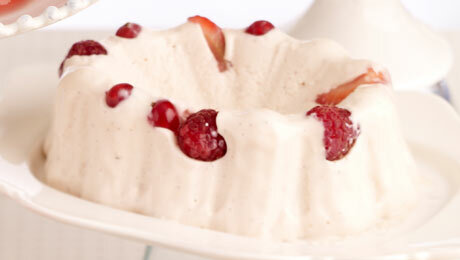 Remove the bowl from the iced water then fold in the cream and add the fresh fruit. Next pour into a clean jelly mould and leave to set in the fridge for at least 2 hours or overnight if possible. To remove the blancmange from the mould, place the mould in some hot water for a minute then invert onto a plate.